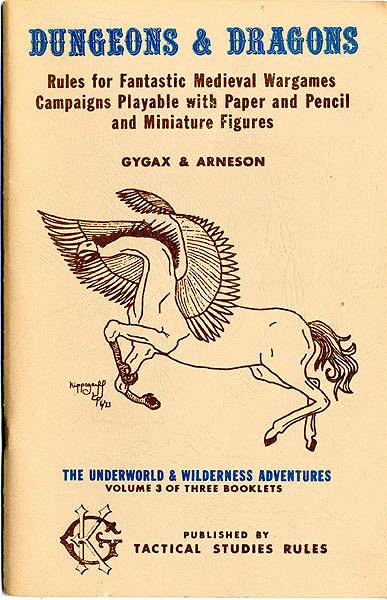 The 1974 Edition of Original Dungeons and Dragons was a unique game with many rules not carried over into later editions. Of the original three books, I found the following rules, most of which don’t appear in later editions. A few are carried into Holmes or Moldvay Basic (some as optional rules), but the combined flavor of these rules was never seen again (Delving Deeper is the only clone I’m aware of that has the explicit goal of adhering as closely as possible to these rules). Some of these are well-known, others are not. I’ve split the rules up based on which book they appear in. [Halenar Frosthelm at the Ruins of Murkhill blog has a nice series of three articles where he discusses which of these rules he used. You can read them here (part I), here (part II) and here (part III). See also this discussion]. Referee rolls starting abilities (3d6 in order) and starting gold. Encumbrance is measured in gold pieces, with 10 GP per pound and a maximum of 3000 GP. Players can be monsters, although there are no rules given for handling them. 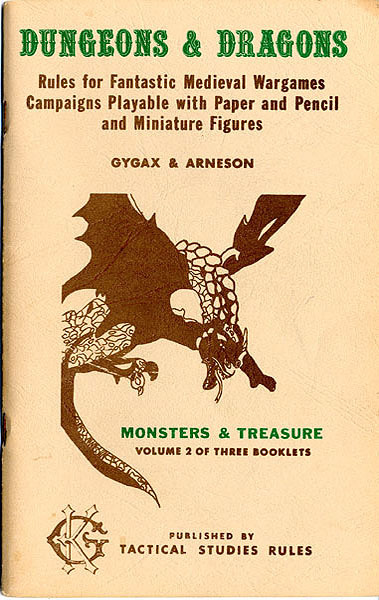 Non-player monsters can be subdued or captured and sold [Note: Subdual rules appear in later editions, particularly with respect to subdual and sale of dragons. Thanks to aldarron at the OD&D house rules board for pointing this out]. Hit points are rolled anew at each level [Note: There is some disagreement over this point, but in the example given on p. 18 of M&M the Superhero, or 8th-level Fighting-Man, with 8+2 HD, details rolling all 8 dice and adding 2 points, it does not have the player adding 1+1 dice to the 7th level HP total of 7+1 HD]. There are no explicit strength bonuses, only a bonus (or penalty) to earned experience for Fighting-Men. Strength is only mentioned as a factor in “opening traps and so on”. Dexterity does not affect armor class, it only confers a bonus or penalty to missile weapon to-hit rolls, and then only +/-1. All weapons do 1d6 damage (the one exception is a spear impalement doing double or triple damage). Magic-Users and Clerics must carry one spell book for each level of spell they know. Clerics must choose to be either Lawful or Chaotic by 7th level. Note that in early printings, Lawful or Chaotic alignment was chosen at character creation. Cure light wounds acts over a full “turn” (10 minutes in the underworld). Monsters are worth 100XP per hit die. Fun fact – in the first OD&D supplement, Greyhawk, this formula is mocked as “ridiculous”. Experience is however limited by the ratio of monster and dungeon level (defeating an orc on the 5th dungeon level gives only 1/5 experience). Players may designate a relative to inherit their possessions should they die. 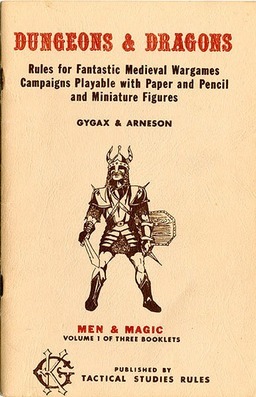 Monsters (later clarified to include players who are Fighting-Men) gain one attack per round as a normal creature against normal men, for each of their own hit dice (“normal” is open to interpretation). Attack bonuses apply to only one such attack. Armor class is static depending on the base armor worn, magical armor bonuses subtract from the opponent’s to-hit roll. Magic shield bonuses only apply if the shield bonus is greater than the magical armor bonus, and then only against 1/3rd of attacks. Certain magic helmets are considered non-protective and will be struck and smashed 10% of the time a hit occurs. Magic swords confer a to-hit bonus only, unless they have a special purpose against a specific monster class. In that case, they provide a to-hit and damage bonus. All magic swords have an alignment, touching a sword of a differing alignment causes the player to take damage. All magic swords are intelligent, but 50% of these have enough intelligence to posess an ego and one or more special powers. Magic sword ego can in some cases guide or even control the sword owner. 10% of all magic swords will have a special purpose, for example slaying some chaotic creature. Scrolls are for Magic-Users only (there are no Clerical scrolls), although protection scrolls can be used by any player, and a note in M&T states that 25% of scrolls found will have spells usable by clerics. The apparent contradiction can be explained by allowing only Magic-Users to use scrolls with Clerical spells. The condition of surprise allows a free move and attack, or two attacks (if the distance rolled is 10 feet, although the second attack could be construed as merely winning initiative the first combat round). There is a 25% chance a surprised player will drop a held item. “Angry Villager Rule” – Players who commit some sort of offense in-game can be brought back into line by an angry mob, thieves from a thieves’ quarter, city watches or even insertion of a Conan-type character. Encountering a Fighting-Man stronghold will result in players being challenged to a jousting match, or paying a toll of 100 to 600 GP. Encountering a Magic-User stronghold will result in either a Geas, “request” for a magic item or toll of 1,000 to 4,000 GP. Encountering a Cleric stronghold will result in either a Quest or a 10% tithe of all money and jewels (lawful Clerics) or an attempt to kill the players who cannot pay (chaotic Clerics). All monsters can see in the dark, but no players can do so. Monsters serving a player (either by subdual or charm) cannot see in the dark, however. Burning oil is only mentioned as a way of deterring monster pursuit. Most dungeon doors are difficult to open for players and doors always close on their own, but monsters have no problem opening them. There is a 1/3 chance that doors spiked open by players will close due to the spikes slipping. Movement is given in inches, but this translates to feet indoors and yards outdoors. There are detailed Aerial and Naval combat rules. IIRC Clerics use spell books as well. M&M p.34, I believe. You’re right – “Characters who employ spells are assumed to acquire books containing the spells they can use, one book for each level.” It doesn’t specify just M-Us, so we have to assume that includes Clerics, different from newer editions where Clerics simply pray for spells.